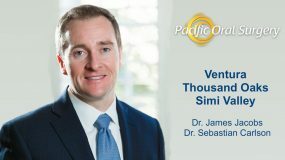 Wisdom tooth extraction, or removal of one or more of the four wisdom teeth, is one of the most common oral surgery procedures performed in the Ventura County offices of Pacific Oral Surgery. The permanent adult wisdom teeth are removed from the socket (dental alveolus) in the alveolar bone of the jaw located at the back corners of your mouth on the top and bottom. Wisdom teeth, also called third molars, erupt last of all the permanent teeth. They typically begin to appear in the mid-teen years, possibly continuing into the early to mid-20’s. Wisdom teeth can develop normally, erupt improperly causing dental problems, or never appear at all. 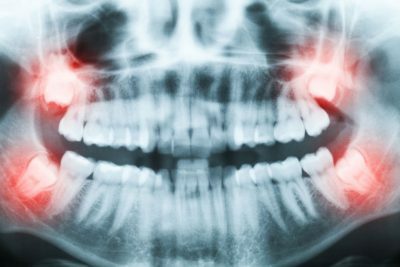 Because their development can be tracked through x-rays, your dentist may recommend wisdom tooth extraction before they ever erupt if a problem is detected. Dental impaction: The wisdom tooth does not erupt completely or at all due to blockage from other teeth, often causing infection and pain. Decay or gum disease: Inability to properly reach the back teeth with floss or a toothbrush can result in cavities. Periodontal disease can occur if food or bacteria become trapped under gum tissue, which is especially possible when wisdom teeth only partially erupt. Small mouth: Some people simply do not have room in their jaws for an extra set of molars. Wrong angle: Wisdom teeth sometimes erupt in the wrong direction or angle (such as the top of the tooth facing sideways, backward, or forward) and cause problems with other teeth. 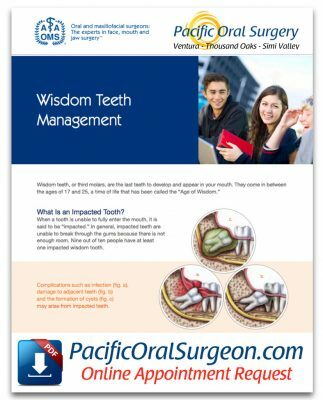 The American Association of Oral and Maxillofacial Surgeons has provided the following video on wisdom teeth management, which can also be downloaded in this brochure. Periodontal (bone and gum) disease: Impacted wisdom tooth protrusion through gums can result in infection, inflammation (swollen red gums), pain, swelling and jaw stiffness. Orthodontic crowding: Crowding of front teeth due to wisdom teeth pushing nearby teeth out of position. 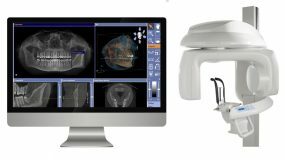 This creates complications with orthodontic treatments. Damage to nearby molars or surrounding bone: An impacted tooth may keep pushing against the molars next to it resulting in damage to both teeth. 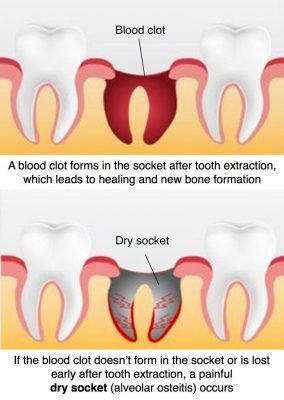 Dental cyst (fluid sac): Development of a dental sac around the tooth that may displace the tooth, destroy the bone, and damage surrounding teeth and gums. 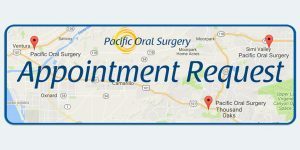 A simple extraction of one tooth may be performed during an office visit to the dentist, but more frequently, an oral surgeon will perform a surgical extraction, especially if teeth are impacted or several teeth are being removed at one time. In the majority of cases wisdom teeth are removed with intravenous sedation, also called twilight sedation. During your wisdom tooth extraction, your doctor will make an incision in the gum tissue, exposing the bone and tooth. Any bone blocking access to the tooth will be removed. The wisdom tooth may be cut into small sections for easier removal. Keep gauze on the extraction site for the first day. Replace the gauze periodically as it becomes blood-soaked. Avoid spitting, as not to dislodge the blood clot forming in the socket at the extraction site. Keep your head propped up to help slow bleeding. Use ice packs on the outside of your cheeks in 15-20 minute intervals to reduce swelling, bruising, and discomfort the first day. Moist heat (warm compresses) can be used the following 2-3 days. Avoid excessive physical activity. Resting is an important part of your speedy recovery. Use over-the-counter pain medication (such as ibuprofen) or any pain medicine prescribed by your doctor to alleviate discomfort. Do not drink caffeinated, alcoholic, or carbonated beverages for at least 24 hours after your wisdom tooth extraction. Water (and lots of it) is the best beverage you can drink after surgery. 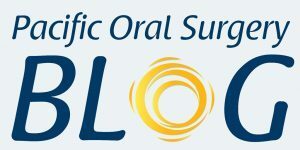 Do not drink with a straw for a few days, as the sucking can dislodge the blood clot from its socket. Eat soft foods (such as pudding, applesauce, yogurt, and thin soup) for 24 hours. Gradually add in more solid foods as you can tolerate them. Avoid chewy or hard foods that may irritate the wound or get stuck in the socket. Do not smoke for at least 3 days after surgery. Chewing tobacco cannot be resumed for a week. Any tobacco use after oral surgery can delay healing by decreasing the blood supply and cause contamination of the extraction site. After 24 hours, you should begin gently rinsing your mouth with warm salt water several times daily. Your doctor will give you specific instructions on oral care after your surgery. Avoid touching or rubbing the extraction site with your tongue or fingers. If you have stitches, your doctor will instruct you on when they should be removed if they are not dissolvable. Normal activity can usually be resumed the day after surgery, with only minor restrictions involving strenuous activities. In rare instances, damage to existing dental work, the jaw, or sinus cavity can occur during extraction.